Destiny and Bill Haggett sat next to the fire, arms around each other, smiling as they watched their five children laugh and jump to catch fireflies on a warm August evening. The kids and their parents were having the time of their lives in the Appalachian Mountains. Life was just about back to normal. Their second-oldest son, 13-year-old Chansen, was celebrating something special: the end of chemotherapy treatment for his second battle with leukemia, which he’s been fighting since age six. To mark Chansen being cancer free, he and his family spent a week at the Believe In Tomorrow House at Pinnacle Falls just outside of Asheville, North Carolina. And they loved it! Chansen and family enjoying the waterfalls. “This was really the best vacation we’ve ever had as a family,” said Destiny. “It was absolutely beautiful every day we were there, and every single family member loved it.” Chansen’s family learned of Believe In Tomorrow’s respite program through another family in their pediatric cancer support group, who raved about the foundation’s mountain house in North Carolina. 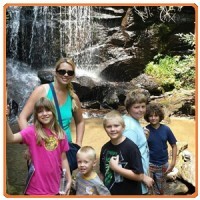 While there, Chansen’s entire family agreed that their favorite part of the week was hiking to the Pinnacle Falls waterfalls. “It was amazing that there was so much beauty, so close to the house!” said Destiny. 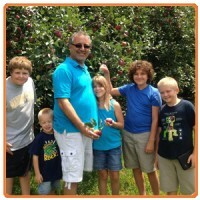 They also enjoyed mining for gems at Elijah Mountain Gem Mine, chasing the roosters and chickens outside of Hubba Hubba Smokehouse while trying out NC pulled pork, floating around a lazy river at Zen Tubing, and picking apples at Sky Top Orchard. Catching fireflies also topped the list, which isn’t possible in their hometown of Cape Coral, Florida, which is too warm for fireflies! To celebrate his end of chemo, Chansen requested homemade apple cheesecake and apple pies with apples from the orchard, which everyone helped bake together at the house. “He’s definitely my inspiration,” said Destiny. After Chansen’s 2007 diagnosis he underwent three and a half years of treatment before going into remission. Just 17 months later he relapsed when scans showed cancer in his spinal fluid. This meant two and a half more years of very heavy treatment, which caused Chansen to suffer a stroke in 2013. But, like the champ that he has always been, he made a full recovery, talking normally and walking out of the hospital less than two weeks later. This past June he completed chemo and was declared cancer-free, for which the entire family is very thankful. “Through everything we’ve been through, I couldn’t imagine how awful and lonely it would have been without the support of family, friends, and organizations like Believe In Tomorrow,” said Destiny. The whole family is all looking forward to Thanksgiving (and more apple pie! ), and they sure have plenty to be thankful for!